(C) 2014 Daniel R. Scholes. This is an open access article distributed under the terms of the Creative Commons Attribution License (CC BY 4.0), which permits unrestricted use, distribution, and reproduction in any medium, provided the original author and source are credited. Endoreduplication is an alternative cell cycle that omits cell division such that cellular ploidy increases, generating “endopolyploidy”. Endoreduplication is common among eukaryotes and is thought to be important in generalized cell differentiation. Previous research on ants suggests that they endoreduplicate in body segment-dependent manners. In this study, we measured endopolyploidy of specific organs within ant body segments to determine which organs are driving these segment-specific patterns and whether endopolyploidy is related to organ function. We dissected fourteen organs from each of five individuals of Dinoponera australis and measured endopolyploidy of each organ via flow cytometry. Abdominal organs had higher levels of endopolyploidy than organs from the head and thorax, driven by particularly high ploidy levels for organs with digestive or exocrine function. In contrast, organs of the reproductive, muscular, and neural systems had relatively low endopolyploidy. These results provide insight into the segment-specific patterns of endopolyploidy previously reported and into the specific organs that employ endoreduplication in their functional development. Future work aimed at quantifying the metabolic and gene expression effects of endoreduplication will clarify how this often overlooked genomic event contributes to the development and function of specialized organs across the breadth of taxa that are known to endoreduplicate. Endoreduplication is the replication of the nuclear genome without cell division such that cellular ploidy increases with each round of replication, generating endopolyploidy. This process can proceed independently among cells and create a mosaic of ploidy levels within an organism (Nagl 1976, 1978, Barlow 1978, Lee et al. 2009). Endopolyploidy has been found in a variety of animals, including many insect orders (Nagl 1976, White 1977, Johnston et al. 2004, Aron et al. 2005). In insects, the occurrence of endopolyploidy is tissue-dependent and is perhaps best characterized in Drosophila melanogaster, where ploidy levels as high as 1024C are found among the polytene chromosomes of the salivary glands and follicle cells, with lower levels of endopolyploidy occurring throughout the organism (Balbiani 1881, Mulligan and Rasch 1985, Lilly and Duronio 2005, Johnston et al. 2013). The highest level of endopolyploidy observed so far is in the insect Bombyx mori, whose silk-producing glands are reported to exceed one million-ploid as a result of intensive artificial selection (Perdix-Gillot 1979). Given the wide range of taxa and cell types that endoreduplicate, endopolyploidy is presumed to have beneficial effects on the basic properties of the cell (Nagl 1976, 1978, Lee et al. 2009). These “nucleotypic effects” (Bennett 1972, 1982) are in part due to the bulk nuclear DNA content that influences cell size, the rate of cell division, and water and nutrient transport efficiency (Nagl 1976, 1982, Barlow 1978, Lee et al. 2009). Other hypothesized benefits of high DNA content, and in particular endopolyploidy, include increased cellular metabolism and gene expression owing to the increase in available gene templates for transcription (Nagl 1976, 1978, Galitski et al. 1999, Osborn et al. 2003). Collectively, the effects of endopolyploidy can influence the development and functioning of highly specialized tissues (Lee et al. 2009) and may occur in response to physiological stress (e.g. Britton and Edgar 1998, Engelen-Eigles et al. 2001, Fusconi et al. 2006, Jimenez et al. 2010, Scholes and Paige 2011). The order Hymenoptera has a long history for studies on intra-individual variation in ploidy (Merriam and Ris 1954, Mittwoch et al. 1966, Rasch et al. 1975). Recently, Aron et al. (2005) demonstrated that haploid males in many hymenoptera generate endopolyploidy such that they are functionally diploid, with the proportion of diploid cells in thoracic, mandibular, and fore-, mid-, and hindleg muscles comparable between males and females of the bumble bee Bombus terrestris. Scholes et al. (2013) surveyed endopolyploidy within and between castes of four polymorphic ant species and found that endopolyploidy varied between workers of different body sizes. Additionally, when body segments were examined separately, ploidy levels of the abdomen were significantly greater than those of the head and thorax, which had comparable ploidy levels. Given the presumed roles of endopolyploidy in cell differentiation, we propose that ploidy levels may be greatest in the abdomen to aid in the development, functioning, and metabolism of the specialized tissues therein. What is now needed is a fine-scale survey of endopolyploidy to document the degree to which ploidy varies within the body segments, and to determine how ploidy may be differentially affecting organ development, specialization, and function. In this study, we surveyed endopolyploidy of a variety of organs within individuals of the ant Dinoponera australis (Hymenoptera: Formicidae: Ponerinae). Dinoponera australis is a large (mean 105 mg dry mass and > 2 cm in length), queenless ant that occurs in northern Argentina, Paraguay, and southern Brazil (Paiva and Brandão 1995). Colonies are relatively small with a range of 18 to 86 females (Paiva and Brandão 1995). As with other members of the genus, all females are born physiologically capable of reproducing; however, a single dominant “gamergate” is responsible for egg-laying (Monnin and Peeters 1999, Monnin et al. 2003). Dinoponera australis has a relatively large genome among ants (554.7 Mb / 1C; Tsutsui et al. 2008) that is composed of numerous small chromosomes (57 chromosomes / 1C; Santos et al. 2012). Given its large genome size, endopolyploidy will conceivably have a major effect in this species. We chose Dinoponera australis for this research to determine whether the patterns of segment-specific endopolyploidy previously reported in numerous ant species (Scholes et al. 2013) are also evident in this unusual ant. Its large size additionally allowed for the extraction of organs from individual ants that were of adequate mass to estimate organ-specific ploidy. Initial characterization of the patterns of endopolyploidy among Dinoponera australis body segments made it possible to determine which specific organs were underlying the segment-specific patterns observed. Given the assumption that endopolyploidy is related to cellular differentiation and function (Nagl 1978, Cavalier-Smith 1985, Gregory and Hebert 1999), we additionally tested whether levels of endopolyploidy correlate with organ function to infer whether organs of similar general function also have comparable levels of endopolyploidy regardless of the segment within which they reside. This information provides important insights into organ development, specialization, and function, with potential further implications into the basis for behavior and sociality given a better understanding of insect physiology. We excavated a single colony in August 2011 from Iguazú National Park, Misiones Province, in northeastern Argentina. The colony was maintained in an insectary at the University of Illinois on a diet of sugar water and crickets. Individuals were a minimum of two years old at the time of analysis. We used carbon dioxide from sublimating dry ice to incapacitate five non-reproducing females prior to dissection. For each individual, we dissected as many organs as possible from each of the head, thorax, and abdominal segments. Dissected organs were placed in a 0.2 ml centrifuge tube on ice until preparation for cytometric analysis. A complete list of organs sampled is provided in Table 1. Organs analyzed for nuclear DNA content by flow cytometry. 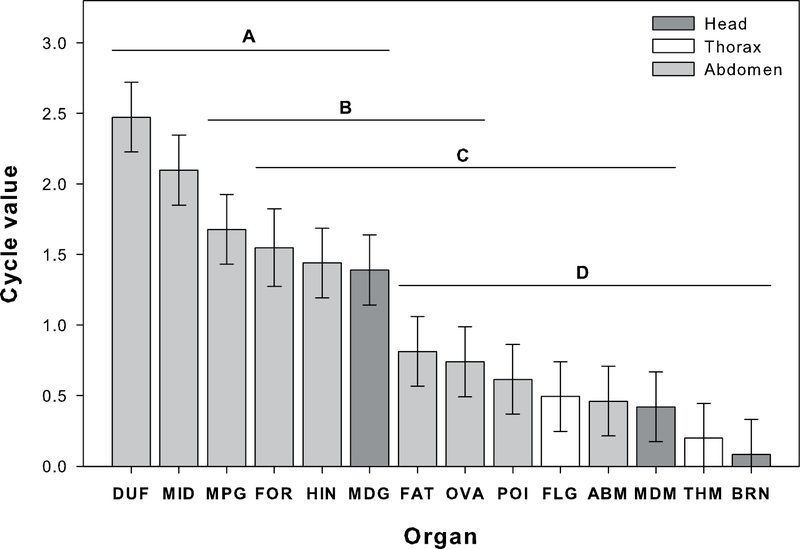 Identity of the 14 organs analyzed, their abbreviations (Abbrev), the segment within which they reside, their demonstrated functions, and the number of nuclei analyzed for each organ (mean ± SE). Symbols designate reference (Ref) or general functional system (Function). as the sum of the number of nuclei at each ploidy level multiplied by the number of endocycles required to achieve that ploidy level, divided by the total number of nuclei measured. The cycle value is interpreted as the average number of endocycles undergone per nucleus in the sample, and is thus directly proportional to endopolyploidy (Barow and Meister 2003). Statistical analyses were conducted as mixed models with SAS PROC MIXED (v.9.2, Cary, North Carolina, USA). To assess whether organs differed from each other across the measured ploidy levels, the proportion of nuclei at each ploidy level was compared among organs by ANOVA with individual as a random effect with five levels (individuals 1–5), ploidy level as a fixed effect with six levels (2C, 4C, 8C, 16C, 32C, 64C), and organ as a fixed effect with fourteen levels (14 organs; see Table 1). Body segments were similarly compared but with body segment as a fixed effect with three levels (head, thorax, abdomen). Additionally, to determine whether differences among body segments were due to differences in the proportion of endopolyploid cells, the proportions of endopolyploid (4C–64C) nuclei were compared among body segments via ANOVA with post-hoc linear contrasts. All proportions were arc-sin square-root transformed prior to statistical analysis to satisfy the assumption of NID(0, σ2). To determine if endoreduplication differed among organs, the composite measure of endoreduplication, the cycle value, was compared among organs by ANOVA with individual as a random effect with five levels (individuals 1–5) and organ as a fixed effect with fourteen levels (14 organs; see Table 1). Comparing endopolyploidy via cycle values rather than across six ploidy levels individually is useful here due to the number of organs compared. Cycle values of body segments were compared similarly with body segment as a fixed effect with three levels (head, thorax, abdomen). For both the organ and body segment models, differences among organs/body segments were determined by Tukey’s Studentized range test (i.e. Tukey’s Honest Significant Difference) to correct for multiple comparisons (Tukey 1953) with SAS PROC MIXED. The effect of the individual on cycle values was tested via the Random-Effects Analysis in PROC GLM. To determine whether the level of endopolyploidy is correlated with organ function, cycle values were compared via ANOVA with individual as a random effect with five levels (individuals 1–5) and functional system as a fixed effect with five levels (digestive, exocrine, reproduction, muscular, neural; see Table 1 for a list of organs comprising each system). Differences among functional systems in their cycle values were determined by Tukey’s Studentized range test to correct for multiple comparisons (Tukey 1953) with SAS PROC MIXED. We quantified nuclei via flow cytometry at ploidy levels doubling from 2C to 64C in 14 organs, though not all organs were composed of all six ploidy levels scored (Figure 1). A comparison of gated and ungated counts showed that careful preparation produced less than 2% of counts of doublets and broken or cytoplasmic tagged nuclei (data not shown). Total, ungated counts are therefore reported at each of the ploidy levels. Overall, organs vary significantly in the proportions of nuclei among the ploidy levels (F(70, 320) = 7.13, p < 0.0001; Figure 1). When assessed across all organs from each body segment, the head, thorax, and abdomen differ in their proportions of nuclei among ploidy levels (F(10, 392) = 10.33, p < 0.0001), due primarily to the abdomen having more nuclei at endopolyploid levels (4C, 8C, 16C, 32C, and 64C) than the head and thorax (abdomen vs. head 4C–64C: t(62) = 4.4, p < 0.0001; abdomen vs. thorax 4C–64C: t(62) = 5.2, p < 0.0001; Figure 2). The head and thorax do not differ in their proportion of endopolyploid nuclei (t(62) = 1.24, p = 0.2198; Figure 2). Distribution of ploidy among organs. Percentage of nuclei at each of the ploidy levels observed (2C–64C) within each organ analyzed. Organs are presented by body segment in descending order of cycle value. Differences in endopolyploidy among body segments. Percentage of endopolyploid (4C, 8C, 16C, 32C, and 64C) nuclei for each body segment. Shown are means ± standard error across 5 individuals. Letters indicate significant (α = 0.05) differences among body segments. Significance was determined by analysis of arc-sine square-root transformed proportions. Organs differ overall in their cycle values (F(13, 51) = 9.57, p < 0.0001), covering a nearly 31-fold range in ploidy (brain: 0.08, Dufour’s gland: 2.47; Figure 3). Overall, these organs comprise two main statistical groups: the Dufour’s gland, midgut, Malpighian tubules, foregut, hindgut, and the mandibular gland have the highest cycle values (group A) while the fat body, ovary, poison gland, foreleg muscle, abdominal muscle, mandibular muscle, thoracic muscle, and brain have the lowest cycle values (group D), although there is some overlap in the statistical groupings for organs of intermediate cycle values (Figure 3). There is no significant relationship between the numbers of nuclei counted and the cycle values among organs (F(1, 67) = 2.03, p = 0.159; Table 1), so differences among organs in their cycle values are not likely due to differences in cell number (i.e. organ size) or technical artifact. We additionally note no significant individual effect on cycle values (F(4, 64) = 0.78, p = 0.5453), indicating that differences in cycle values are not dependent on the individual from which they were measured. 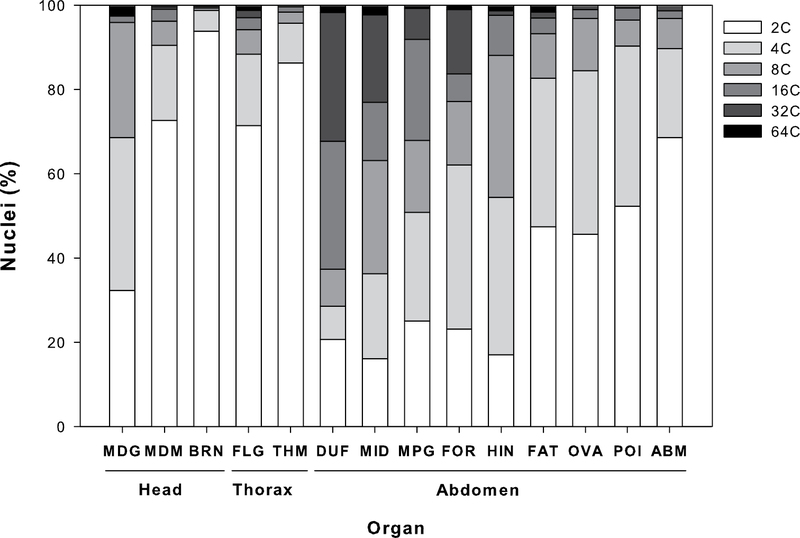 When organs are considered in relation to their body segments, the abdomen has the highest cycle values (abdomen vs. head: t(62) = 2.88, p < 0.05; abdomen vs. thorax: t(62) = 3.49, p < 0.01), with no difference between cycle values of the head and thorax (t(62) = 0.88, p = 0.6532). Cycle values for each organ analyzed within each body segment. Shown are means ± standard error across 5 replicates of each organ within each body segment. Organs are presented in descending order of mean cycle value. Bars labeled with letters denote statistical groups determined by Tukey’s Studentized range test (significance tested at αfamily = 0.05). Upon relating organs to their functional groups (Table 1), endopolyploidy, measured by cycle value, differs among major functional systems (F(4, 60) = 11.83, p < 0.0001). 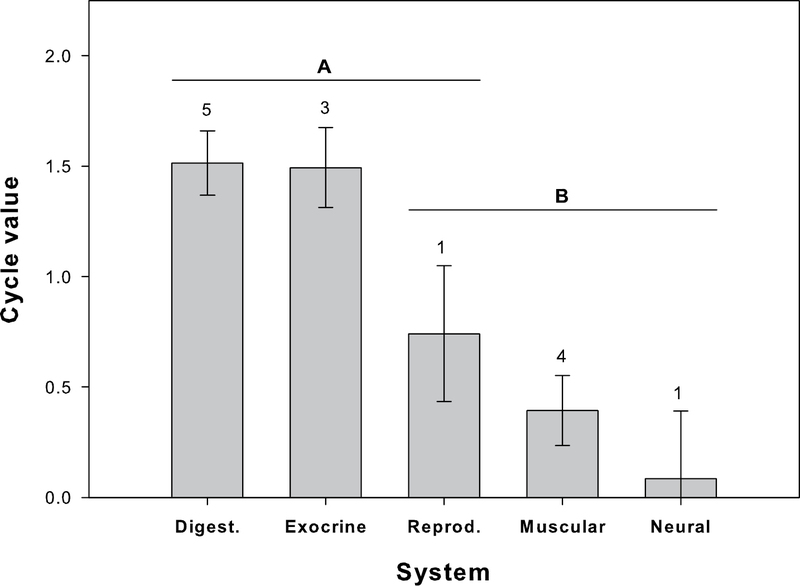 Specifically, systems comprise two main statistical groups—the digestive and exocrine systems have the highest cycle values (group A), while the muscular and neural systems have the lowest cycle values (group B; Figure 4). The reproductive system has an intermediate cycle value and is shared among statistical groups (group AB). Further, while the fat body is typically considered to be part of the digestive system, it is not directly part of the ingestion/excretion pathway (i.e. the gut). Upon exclusion of the fat body from the gut (i.e. the foregut, midgut, hindgut, and Malpighian tubules), the average cycle value of the digestive system increases from a value of 1.51 with the fat body to 1.70. This exclusion changes the significance groups such that the digestive system has the highest cycle value (group A), the muscular and neural systems have the lowest (group C), and the exocrine and reproductive systems have intermediate cycle values (groups AB and BC, respectively). Endopolyploidy of organs by functional system. Cycle value of organs within each functional system (abbreviations “Digest.”: digestive; “Reprod.”: reproductive). Shown are means ± standard error across 5 replicates of each organ within each system. Systems are presented in descending order of mean cycle value. Bars labeled with letters denote statistical groups determined by Tukey’s Studentized range test (significance tested at αfamily = 0.05). Numbers above each bar indicate the number of organs that comprise each respective system. Previous studies have documented instances of insect endopolyploidy in a qualitative (White 1977 and references therein) or semi-quantitative (e.g. Johnston et al. 2004, Aron et al. 2005, Scholes et al. 2013) manner. Here, we show that flow cytometry can be utilized to provide a fully quantitative comparison of endopolyploidy within and among organs. Using this technique, we are able to quantify for the first time the extent to which endopolyploidy varies within an insect, with a wide range of ploidy levels detected across the 14 organs examined in the ant Dinoponera australis. Specifically, organs from the abdomen collectively had greater endopolyploidy than those of either the head or the thorax. Ploidy levels were highest in organs of the digestive and exocrine systems, and especially of the gut, suggesting that endoreduplication may be particularly important in development and/or organ function in these systems. This information provides the basis from which questions regarding the role of endopolyploidy in insect development, behavior, physiology, body size, caste differentiation, etc. may be addressed. Our results for this unusual ant support the body segment-specific differences previously reported for four other ant species (Scholes et al. 2013). Specifically, Scholes et al. (2013) determined that regardless of species, caste, or worker body size, the abdomen had consistently greater endopolyploidy than the head and thorax, which had lower, comparable levels. However, our tissue-specific analyses revealed substantial variation in endopolyploidy among organs within body segments. The importance of endoreduplication in segment function and development may therefore be misrepresented if not assessed with regard to specific organs or tissues. For example, the abdomen has high endopolyploidy overall, yet is composed of a variety of organs with relatively high or low endopolyploidy. Patterns in segment-specific cycle values appear to be driven strongly by organ function. For example, the abdominal organs of the digestive system (and particularly the gut) and the Dufour’s gland of the exocrine system have high endopolyploidy. The mandibular gland of the exocrine system also has high endopolyploidy, yet it resides within the head, where the organs otherwise analyzed have very low endopolyploidy and serve other functions. Given endoreduplication’s presumed roles in cellular development (Nagl 1976, Lee et al. 2009), endopolyploidy may therefore be particularly beneficial for cells of digestive and exocrine function by increasing metabolic potential and gene expression through increased genome copy number, and/or by increasing cell volume for the production and storage of metabolites (Nagl 1976, 1978, Lee et al. 2009). While ploidy has not yet been related to measures of digestive demands or the production or storage of chemicals within these organs, the extremely high ploidy of the Bombyx mori silk gland (Perdix-Gillot 1979), as well as of the Drosophila melanogaster nurse cells and salivary gland (Balbiani 1881, Mulligan and Rasch 1985), suggests that endoreduplication can be an effective mechanism to support high cell metabolism and specialized function. 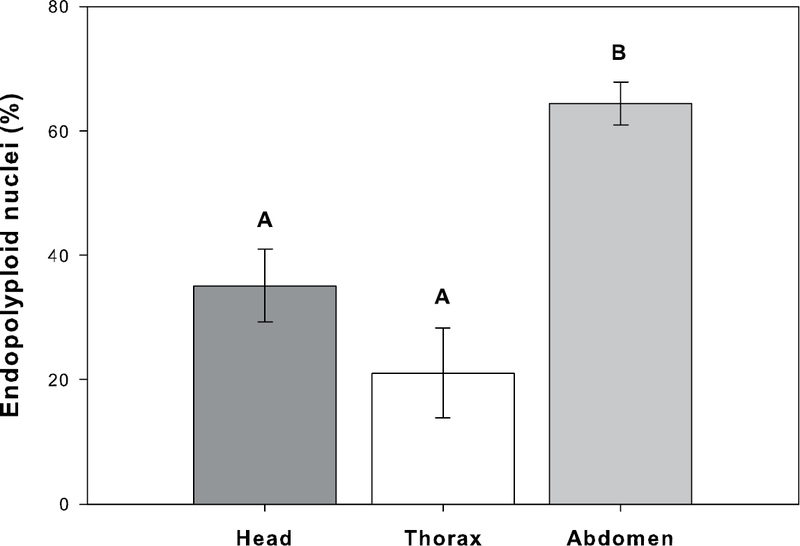 The muscular tissues sampled (mandibular, foreleg, thoracic, abdominal) have comparably low levels of endopolyploidy regardless of their body segment (head, thorax, abdomen), likely due to their shared function. Aron et al. (2005) compared muscles of the head and thorax of female bumble bees and found no difference in the distribution of ploidy levels among thoracic, mandibular, fore-, mid-, and hindleg muscles, further suggesting a relationship between endopolyploidy and function for these tissues. Of additional interest is the moderate level of endopolyploidy observed in the Dinoponera australis ovary—a tissue one might expect to have high metabolic demand. Our results are likely due in part to the presence of both somatic endopolyploid cells (e.g. nurse cells) and meiocytes (1C, 2C, and 4C) with moderate ploidy levels overall. Endopolyploidy is thought to be particularly important for organisms to compensate for the metabolic and genetic decrements of their small genome sizes (Nagl 1976, 1978, Galbraith et al. 1991, Barow and Meister 2003), yet patterns of endopolyploidy in Dinoponera australis are comparable to other species examined, including Pogonomyrmex badius whose genome is over 2× smaller than that of Dinoponera australis (Pogonomyrmex badius: 262.8 Mb / 1C; Dinoponera australis: 554.7 Mb / 1C; Tsutsui et al. 2008). Karyotypic analysis of four Dinoponera species revealed that the genomes in this genus are composed of a large number of very small chromosomes (e.g. Dinoponera australis: 2n = 114 chromosomes; Santos et al. 2012), such that the highest ploidy level observed here, 64C, represents 3648 nuclear chromosomes per cell. The discrepancy between the expected and observed relative rates of endoreduplication given the genome size of Dinoponera australis may therefore suggest that genome organization (i.e. chromosome number and size), in addition to genome size, influences the rate of endoreduplication. Endopolyploidy is hypothesized to impact cells through associated nucleotypic effects, which are not based on the cell’s genotype, and/or genetic effects including genome or gene pathway up-regulation (Bennett 1972, 1982, Nagl 1976, 1978). Endoreduplication may thus promote cell differentiation and specialization in two integrated ways: 1) nucleotypic effects, such as increased cell size, can provide the necessary cell volume, improved transportation efficiency, and other beneficial effects that support cell differentiation generally, while 2) differences among cells in the continuation of endoreduplication beyond this level induce differential gene expression that supports the cell’s functional fate through specific impacts on metabolism, chemical production, and/or other processes. Certainly more research is necessary to determine the impact of the organ-specific endoreduplication reported here. For example, the use of whole transcriptome sequencing would allow the examination of gene expression across organs or tissues of interest and help relate endopolyploidy to the functions of specific gene pathways. We thank Bill Wills for help with colony collection, Fred Larabee for help with colony maintenance, and Amy Gervais for help with flow cytometry. For permission to collect and export Dinoponera australis, we thank the Administración de Parques Nacionales de Argentina (specifically Parque Nacional Iguazú), Paula Cichero, Karina Schiaffino, Silvia Fabri, and CIES. The ants were imported under USDA APHIS permit number P526P-10-01369. This research was supported by grants from the National Science Foundation (DEB 1020979 to AVS and DEB 1146085 to KNP). Balbiani EG (1881) Sur la structure du noyau des cellules salivaires chez les larves de Chironomus. Zoologischer Anzeilger 4: 637-641. Bennett MD (1982) Nucleotypic basis of the spatial ordering of chromosomes in eukaryotes and the implications of the order for genome evolution and phenotypic variation. In: Brandham PE, Bennett MD (Eds). Genome Evolution. G. Allen and Unwin (London): 239-261. Britton JS, Edgar BA (1998) Environmental control of the cell cycle in Drosophila: nutrition activates mitotic and endoreplicative cells by distinct mechanisms. Development 125: 2149–2158. Cavalier-Smith T (1985) Cell volume and the evolution of eukaryotic genome size. In: Cavalier-Smith T (Ed). The Evolution of Genome Size. John Wiley & Sons (New York): 105-184. Gronenberg W (2008) Structure and function of ant (Hymenoptera: Formicidae) brains: Strength in numbers. Myrmecological News 11: 25-36. Gullan PJ, Cranston PS (2005) The insects: an outline of entomology. Blackwell Malden (Massachusetts). Klowden MJ (2007) Physiological systems in insects. Elsevier (Amsterdam). Nagl W (1978) Endopolyploidy and polyteny in differentiation and evolution. Elsevier/North-Holland Biomedical Press (Amsterdam). Rasch EM, Cassidy JD, King RC (1975) Estimates of genome size in haploid-diploid species of parasitoid wasps. Journal of Histochemistry & Cytochemistry 24: 317. Tukey JW (1953) The problem of multiple comparisons. Princeton University Press, Princeton. White MJD (1977) Animal cytology and evolution. Cambridge University Press, Cambridge.